2018 has come to a close, and we are now setting goals and planning and striving to meet them in January of 2019. This is the most popular focus of people in the U.S. in the month of January. 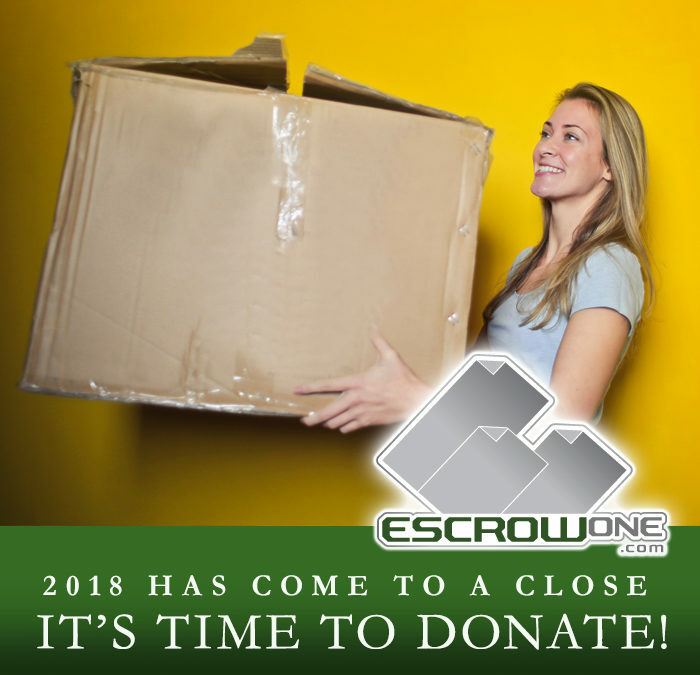 At EscrowOne, Inc. we would like to remind you that this is also a great month to DONATE! There are many ways you can donate. You can choose to donate in a way that requires very little effort on your part, such as donating blood or clothing articles, or you can become a permanent member of a charity or effort of your choice, providing continued support and donations. Both types of donations are very beneficial to your community and beyond. Your donation can be tailored to the amount of time or wealth you have to offer. Donations can also provide you with beneficial gain. The most common benefit that one thinks of when we say donation, is a tax deduction! Even more satisfying is the self-pride and character you can gain. Another great feeling is when one cleans out their closet or home of unused or unneeded items. This also gives us a sense of pride, organization, and a feeling of being in charge, all of which empower us. This is a great start to reaching our goals that we have set for ourselves in 2019! Clean out your closets, home, and garage of items that you have not used, don’t need, no longer want, or simply would like to replace. Be sure to check pockets for left-behind items and remove any pins or staples that may be on dry-cleaned items. Check your charity or donation center’s rules and drop-off places/times for your area. Some charities will pick up larger items. You can contact them directly to schedule. Do your research and send your donations to an organization with great need or one dear to your heart. Always get receipts for the value of your donated items and check with your CPA/tax preparer to see how this may be a beneficial tax deduction for you. There are many places where you can donate blood in your area. Some choose to donate on a frequent basis, and others donate once a year. Check your local blood bank for dates and times to coordinate with your schedule. Donating blood takes only 20 to 30 minutes of your time and can save the life of another. There are many programs that will take car donations. If you have a vehicle that is in fair to good condition, research the programs in your area. Some of the more reputable organizations will also handle all DMV paperwork on your behalf at no cost to you. Vehicles can be donated to Disabled Veterans, Habitat for Humanity, Kars4Kids, or to the DMV itself. This is a much better option than letting your car deteriorate in your driveway or take up space in your garage. Check with your accountant or tax preparer for the tax deduction benefits you might be entitled to and how it can be advantageous to you. One can donate time at many local organizations, programs, or benefits in their area. Sometimes, it is nice to just be present. Try giving and sharing time or spreading cheer with positive vibes and a smile at a hospital gift shop, at a library reading to children or special-needs persons, at a local food drive, or at your church. You can also give the gift of your time to neighbors who may need help with household maintenance tasks, offer a friend in need a ride to the market, or invite someone to enjoy a warm cup of coffee with you. You never know how a small moment of your TIME can affect others. Many of you have a specific skill that can be an asset to your community as well as meet a desperate need in disaster areas. Actions speak louder than words, so the donation of your labor or skill is a beautiful gift to those in need of help and services. Tradespeople such as construction workers, gardeners, accountants, electricians, drivers, social media coordinators, graphic designers, chefs/food preparers, organizers/planners, etc. are just a few of the skilled professionals who can use their talents to benefit others. Be observant of needs in your local area. Building a ramp to a door for wheelchair access, removing a downed tree, or preparing baked goods for a retirement home on a special occasion are a few of the many services we can offer to our communities. Search the web for an organization that could greatly profit from the skill that you have to offer. Some websites have skill-match tools that can put you in touch with the needs in your area or surrounding areas. You can check with your tax preparer or accountant to see if donating a skill can be a tax deduction for you, especially if items or supplies are a part of your donation. Donating money to your favorite charity or cause is an easy but generous way of giving. Many of us contribute to a charity that we simply admire, respect, and feel the need to help, while others donate to charities that have affected their lives or the life of a family member in a time of need. This could be due to health or a disaster, but it may have caused an organization to become dear to them because of a grateful heart. Donations can be scheduled on a regular basis such as weekly, monthly, or yearly. We are all free to donate what we can based on our current financial situations. Yes, you can donate real property to a church, nonprofit charity, etc. Although this is not the most common way to donate, it can be a huge asset for these types of organizations. Always know the needs and benefits, and always talk to your CPA/tax preparer to see how this donation can work for you regarding State and Federal Tax and/or tax deductions. Be cautious and make a great effort to research the entities that you choose. Talk to others, such as family members, who have your best interests at heart, and get references. Check licensing with your State Licensing Department and the Better Business Bureau. Be aware of scams and fraud, and donate to charities and organizations that you seek out, not ones who seek you out. EscrowOne, Inc. would like you to have a safe and prosperous 2019!